Says he wanted to have me back one minute, and the very next minute Juice has drafted one of my teammates. Suuuure ya were, Bart. You thought you were going to double down on your f*ggotry and try to troll me on PM. That's what really happened. All good though. If @juice64011is willing to dive in and take my guys, clearly he doesn't see a problem with it either. Oh well. I asked you if you wanted to comeback. You couldn't just answer the question. I'm not going to kiss your **** for you to play. I was trying not to pick your guys, I thought JSW had Blaydes and was done playing. Yup, and all you had to do was act like a man in here, admit you were being feggit (like everyone unanimously agreed on), and put my team back in. You didn't need to be fake and PM me after you were posting I was on ignore in here. I don't for one second believe you were about to let me back in. You're still working on coming across like you have the moral highground in a situation where you used a move someone else made this week to deduct camp value from me for a move four months prior, and then kicked me out when you weren't allowed to run your dictatorship as planned. Facts. I'm not going to butter you up when you were in the wrong. **** that, **** this game, and **** everybody still willing to play it. **** it. EDIT: This is directed as D0uche-O-Lino, and I'm done with this thread now. I've been playing this game for an hour and I'm tied with @Bubba_Sparks in wins. I'm bad luck for my fighters. It's official. Jesus there at it again . You gave it a good run. With OP doing his best to rig the game, the deck was stacked against you from the start. Lol not u Bart. If it makes u feel Better he was gonna be the one to pull the trade for dillashaw and release him thing, I imagine that doesn’t surprise you. Busted. Big time. Yeah buddy. I cant make it any easier for you guys. Everyone's roster is by ranking then weight class. 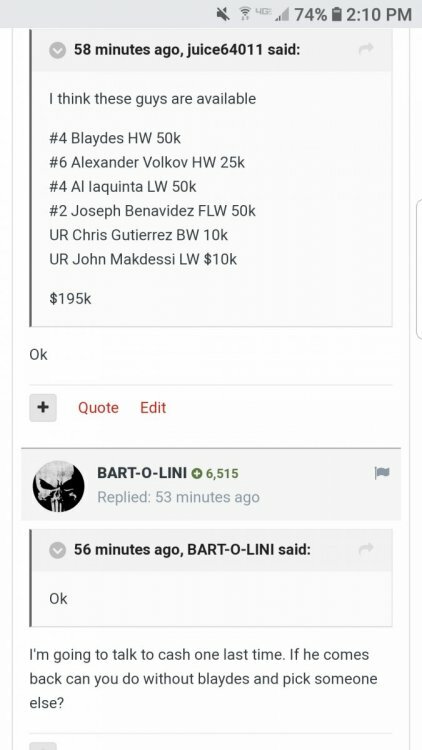 I bought Joe B because Cejudo's manager said that he wanted that fight next, then Baldie said he wants Cejudo vs Moraes. I sold Moraes because I heard Baldie was working on Dillashaw/Cejudo 2. So, I'm right there with you. It was your second most stupid move of the week, seeing as how you signed up to a rigged game, just as the OP was being exposed as a cheater in about six different ways. Anybody interested in Overeem 25k? Definitely has been cheating and rigging the game on PM all season. Then he decides to flip multiple rules in his favor (without the precious vote he used to demand at every turn when someone else ran the game). 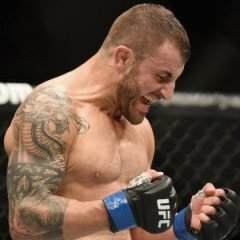 When I put my foot down, he was actually changing a rule back so that Shkrelz could get a free $50K by refunding TJ Dillashaw ($25K more than it should be) after he relinquinshed his title, but only because Shkrelz wouldn't give him to Bart and let Bart do the cheating himself. So then Bart decided that if that particular deal isn't fair, then I should have $35K deducted from my camp value for a move made four months ago. Literally every person said no, but Bart being the cheater he is, just decided to throw me out anyways. Then these other clowns with no integrity or self-respect just piled in and kept playing. It was obvious he only took over the game because he couldn't win by himself and wanted to cheat. Then that didn't cut the mustard, so he made up a reason to throw me out. Sad to see the second best game on the forum get killed because of a feggit and some guys with no integrity. All my fighters are available for purchase except Johnson and Reem. Holler at me if you're interested in someone. 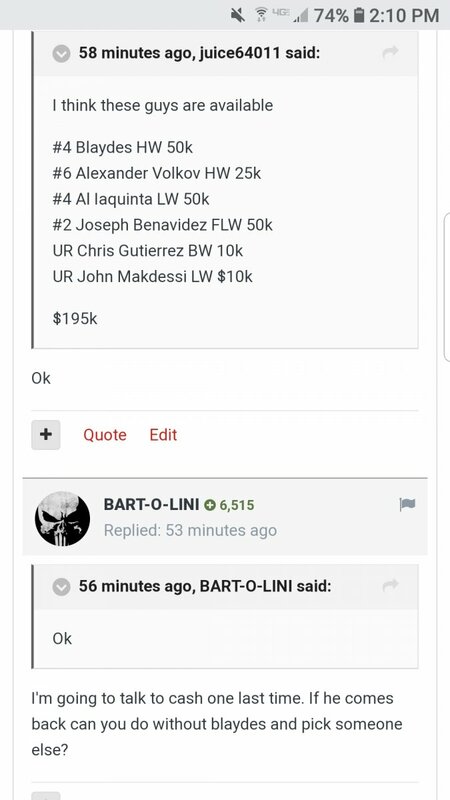 @RadLad @Shkrelz do you guys have side bet on Barbosa/Gaethje? 5k max non title fight. 10k max title fight.